What makes the Outdoor Living Pod™ Weatherproof? Find out the features that makes this the ideal patio canopy for all year round use. At Caribbean Blinds we believe that you should make the most of your outdoor living space and we don’t mean just in summer. Your garden space should be a retreat that you can go and relax in and enjoy the benefits of the natural air and light. This can be particularly difficult to do all year round when you do not have the appropriate features in place to aid. 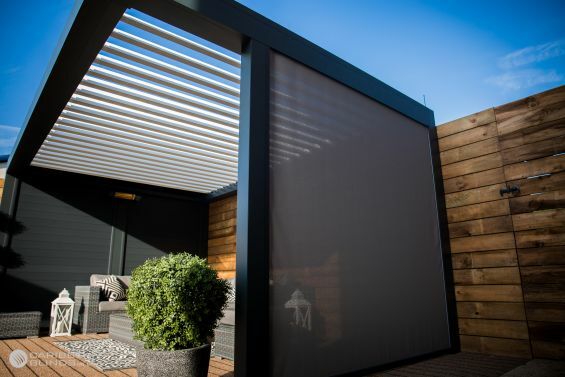 With the Caribbean Blinds Award Winning Outdoor Living Pod™ this can be achieved, it has been specifically engineered to combat the elements. 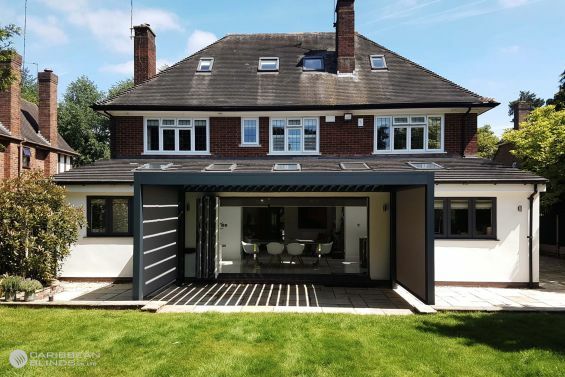 The robust aluminium frame houses a list of innovative features that turn this into the ideal patio canopy to host all your occasions. 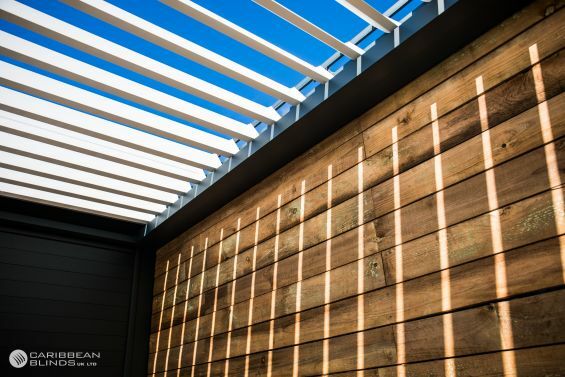 The pergolas main attraction is its electronically operated louvered roof that can be rotated to a full 150 degrees to give you full control of the amount of sun you want to filter through into your space. 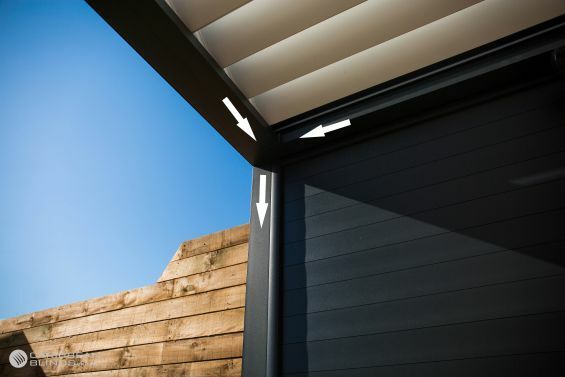 When closed the roof louvers interlock to create a tight protective seal against rain, wind and snow. 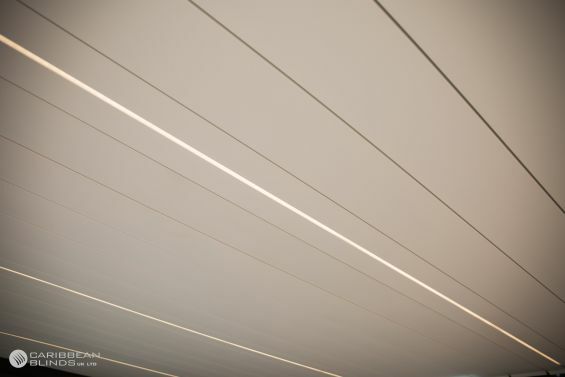 Within the internal perimeter of the canopy structure is an effective guttering system that interconnects with the down pipes located within a nominated upright post to alleviate the roof from water build up. Optional side screens can be integrated on all sides to provide protection against rain, low sun light and wind. The Nano technology coated fabric combined with the sophisticated zip lock technology makes it robust and durable against harsh weather conditions. Optional perimeter lighting or louver integrated lighting can be added to prolong your day’s right into the evenings so you can enjoy being outdoors for longer. 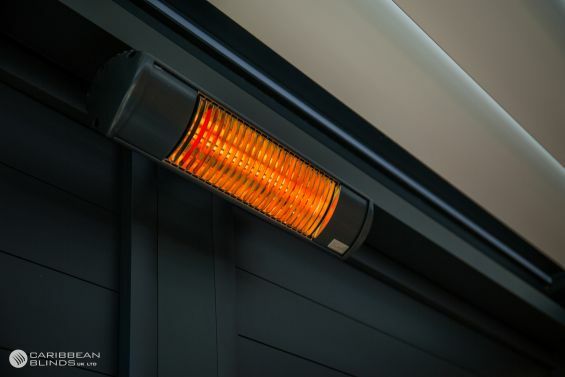 Optional infra-red heating can be mounted to any sides you desire to provide radiant heat to keep you warm through those chilly evenings. The Outdoor Living Pod™ is a completely bespoke garden feature that can designed to specific requirements. If you have an intricate landscape or obstacles that need to be resolved then contact our knowledgeable team members to discuss your options. It’s time to unlock your gardens true potential for all year round use - 0344 800 1947 or alternatively you can use our quick enquiry form to receive your detailed product brochure.